You can order your very own copy now! Before Millennials entered the workplace, most leaders felt capable of managing employees and meeting the challenges they encountered. Now many are struggling to understand why the methods that worked for ages are no longer working, and to figure out what will. Discover what 25 years of research and more than 50 years of collective experience with leaders around the world uncovered in POWER SHIFT: THE NEW RULES OF ENGAGEMENT. Why traditional management no longer works, and what does. What growing factors are leading to one of the biggest power shifts in history. How leaders can create a work culture that fosters engagement and harnesses the energy and talents of the new workforce with ease. Three key traits of successful leaders and which one will be most effective during this unprecedented power shift. The 4 P's to influential leaders use to attract, develop, and sustain high performers. POWER SHIFT: The New Rules of Engagment is available to order NOW! 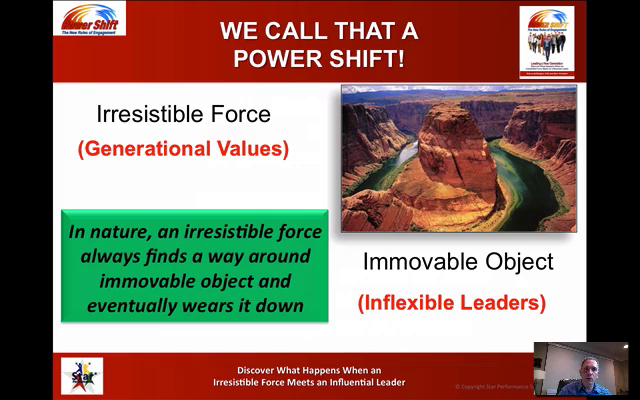 "Powershift: The New Rules of Engagement is a wonderful guidebook for the global leader of the future! It shows how leadership is evolving - what it was in the past, what it is today and what it is going to be tomorrow, and provides great coaching for a new generation of leaders!" “Power Shift will trigger a new mindset around understanding the unique value proposition Millennials want and what they offer at work. Millennials are craving growth, development and intellectual stimulation far more than money, title and recognition. The authors provide a broader understanding of the most effective leadership strategies and a clear road map for developing deeper connections between managers and Millennials."